The Chicago Blackhawks beat the Detroit Red Wings on Sunday for their seventh straight win. CHICAGO (AP) — Dominik Kahun has turned into a dangerous scoring option for the Chicago Blackhawks. Playing with Dylan Strome and Alex DeBrincat sure helps. 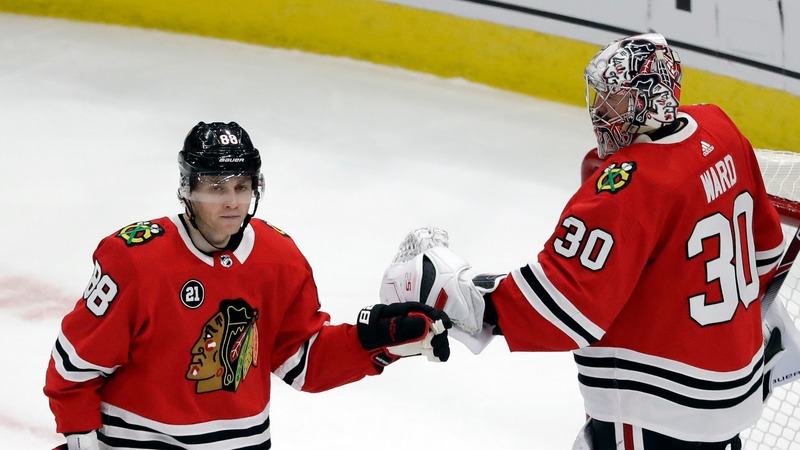 Kahun had two goals and an assist, Cam Ward made 43 saves and the Blackhawks beat the Detroit Red Wings 5-2 on Sunday for their seventh straight win. Chicago's second line of Kahun, Strome and DeBrincat delivered once again as the Blackhawks continued their surprising push after a lackluster first half of the season. Strome had a goal and two assists, and DeBrincat extended his career-best point streak to eight games with three assists. "It's working good for us and we just hope that we can keep going," said Kahun, who has three goals and four assists in his last four games. Strome, who came over in a Nov. 25 trade with Arizona, also put up big numbers while playing alongside DeBrincat with the Erie Otters in junior hockey. Kahun has shown the ability to produce while playing on a couple different lines during his first NHL season. "They made a lot of plays for us," coach Jeremy Colliton said. "At key times, too." After Detroit pulled within one in the third period, Patrick Kane responded with his 33rd goal for Chicago. Kane made it 4-2 when he beat Jonathan Bernier low on the stick side with 3:33 left, extending the NHL's longest active point streak to 14 games. Kane tacked on an assist when Jonathan Toews added an empty-netter with 2:01 remaining. It was Toews' 25th of the season. Gustav Nyquist and Christoffer Ehn scored for Detroit (21-28-7), which dropped its third consecutive game. Bernier made 31 stops. "Standing at the blue line as a D man and watching guys go by is not good enough," coach Jeff Blashill said. "Coming back and picking up the wrong guy's not good enough. I didn't think there were particularly hard reads. We just had a bunch of guys in my opinion whose brains weren't going at a high enough level." The Red Wings were coming off a 3-1 loss at Buffalo at Saturday. Nyquist's 14th goal got them within one with 4:30 remaining, but they were unable to run down the surging Blackhawks. It's the longest winning streak for Chicago (23-24-9) since it won seven in a row from Feb. 19 to March 4, 2017. The crowd of 21,941 — a season high for the Blackhawks at the United Center — roared as the final seconds ticked off. "We're a tough team to contend with when we're playing the right way," Strome said. "We've got four good lines, and everyone brings something different to the table." Chicago got off to a fast start behind Kahun, Strome and DeBrincat, who each had two points in the first period. Kahun scored his 10th goal of the season when he lifted a loose puck over Bernier's glove at 11:04. Kahun tried to pass to DeBrincat, but it went off Detroit defenseman Danny DeKeyser and right back to him. Kahun then set up Strome's 14th goal of the season. He skated down the right side and played it into the middle, where his pass went off Strome's right skate for a 2-0 lead with 1:57 left in the first. "It's really frustrating and disappointing that we gave away the first period really," Ehn said. Detroit played much better in the second and broke through after Kane turned it over near the blue line. Ehn skated in and drove a wrist shot from the left point over Ward's left shoulder 15 minutes into the period. It was the second career goal for the rookie forward. He also scored Dec. 23 at Toronto. The Blackhakes were a -160 favorite. The Red Wings put more pressure on Ward toward the end of the period, but the goaltender gloved a loose puck in front to help hold them off. __NOTES:__ Colliton had no update on G Corey Crawford, who joined practice on Saturday for the first time since he suffered a concussion on Dec. 16. "Hopefully he can string a few more good ones together," Colliton said. ... Blackhawks D Carl Dahlstrom was active, and Gustav Forsling was a healthy scratch. Dahlstrom, Forsling and D Slater Koekkoek have been rotating in and out of Chicago's lineup. ... The Blackhawks and Red Wings play again on Feb. 20 in Detroit. UP NEXT Red Wings: Visit the Nashville Predators on Tuesday night. Blackhawks: Visit the Boston Bruins on Tuesday night.